This post is sponsored by Robin K. Bennett Raising Your Puppy™ and the BlogPaws® Pet Influencer Network™. I am being compensated to help share information about Raising Your Puppy™ online course, but Big Dog Mom only shares information I feel is relevant to my readers. Robin K. Bennett™ is not responsible for the content of this article. Getting a new puppy is one of the most exciting events in a person’s life. After countless hours of research, you have picked your breed and found your reputable breeder. You spend the next 63 days eating, sleeping and breathing all things PUPPY until the day finally arrives that you can bring your new puppy home. If you are like so many people, you focus your attention on puppy-proofing your home, buying toys, beds and crates, and, finding a veterinarian. Unfortunately, all too often, plans for puppy training don’t come up until the puppy has peed on every rug and chewed on every piece of furniture (and every person) in the house. Let’s be honest, puppies can be exhausting. It wasn’t that long ago that I brought my not-so-little bundle of Junior home, so I am keenly aware of how exhausting it can be to raise a puppy. 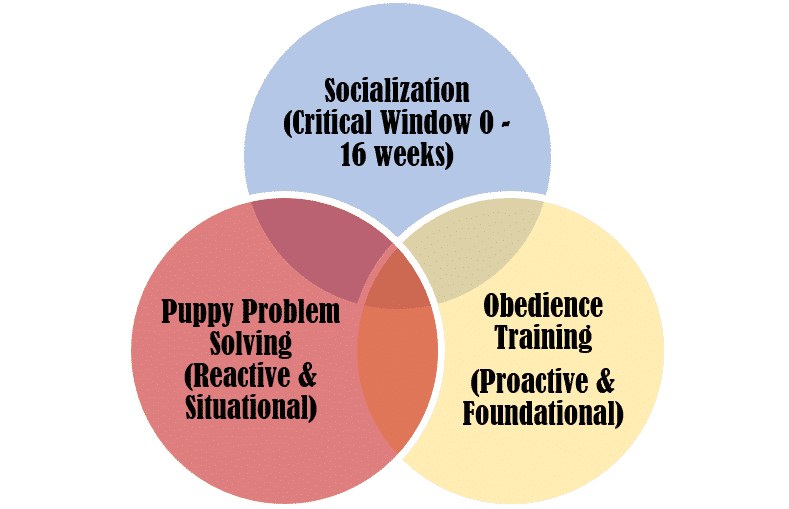 The primary challenge during this time is balancing the three prongs of the puppy paradigm: socialization, obedience training, and problem solving. Introducing the Raising Your Puppy™ training course from Robin Bennett, an ultimate, online, video guide to your puppy’s first 6 months designed for busy pet parents and their newest bundle of joy to help you break through the chaos of puppyhood and get your puppy started off on the right paw. I have had access to this puppy training course for about a week, long enough to view all of the videos, read all of the documents and even try out a few of the tricks on Sulley and Junior (check out our video below). The Raising Your Puppy™ online video course provides you with a comprehensive step-by-step guide on what to do from the moment you bring your puppy home. As someone who has trained many puppies and attended numerous training facilities and group classes, I have seen the good and the bad as it relates to puppy training. Many trainers focus on the basics like “sit,” “down,” and “come,” and after 6 weeks of puppy class, new puppy owners wrongly assume mastery of those skills is all they need. In this video course, you and your puppy will walk away with all of the basics of obedience (sit, down, stay, wait, and come), as well as so many more foundational skills never taught in a traditional 6 week group puppy training class (clicker training, door manners, platform (go to your mat) training, introduction to swimming, confidence building, canine body language, impulse control, and more tricks than you can count). Raising Your Puppy™ uses a rewards based approach to puppy training with praise, treats and a clicker. As a firm believer in this training methodology, I got a huge kick out of watching Robin’s little puppy, Ranger, sit, down, come, spin, play dead and more at less than 12 weeks old. Junior and I were so inspired by Robin and Ranger that we decided to try a few of their tricks on our own. Using Robin’s easy to follow video, Junior and I have almost mastered one of them after just a few repetitions. By training alongside Robin and Ranger in Raising Your Puppy™, you will be establishing a life-long relationship built on love and trust and a foundation of skills and behaviors that are essential for a well-behaved canine good citizen. With this online puppy training course you will have access to over 100 short 2-3 minute videos that you can watch when you have time. If you are like me, your daily and nightly schedule, during the week and on weekends, is packed with so many other activities that blocking off 2 hours or more for a group class once a week is easier said than done. The Raising Your Puppy™ video course makes that hassle a thing of the past. Each week you get a series of short video tutorials covering specific aspects of training based on your puppy’s age. Robin includes a weekly printable “What to do this week” checklist, goal tracking and milestone check in’s to ensure you and your puppy are on track. 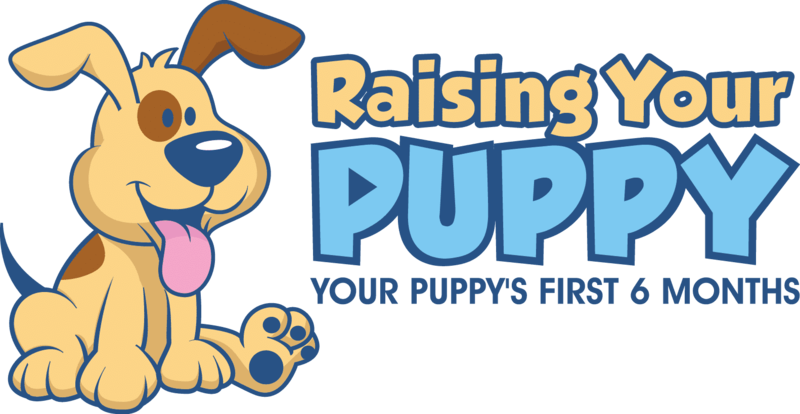 In Raising Your Puppy™ you will receive tips and advice from Robin Bennett for every week of your puppy’s development from 8 weeks to 6 months of age. This is where you can ask questions of Robin and the network of other new puppy parents. Join Robin Bennett and her puppy, Ranger, in Raising Your Puppy™ and get the instant help you need. And if you sign up in the next two weeks, you will receive 3 great bonus items for free! Robin Bennett is a Certified Professional Dog Trainer, author, consultant and expert on dogs. She founded one of the largest dog training companies in Virginia. She has been “reading dogs,” teaching families how to train dogs, and working in the pet care industry helping others keep dogs safe for over 20 years. Robin is also the Chair of the Board of Directors for the Association of Professional Dog Trainers, the premier dog training association with over 5,000 members. This is a sponsored conversation written by me on behalf of Robin Bennett. The opinions and text are all mine. Well done on a lovely post. I think it is so helpful that someone has made a course for people to prepare for a puppy. I would not have a clue and probably do everything wrong without something like this! Thank you so much, Marjorie! I consider myself an above average trainer and I walked away with several pages of new tricks and ideas for ways to improve what I am doing. I really think there is something here for everyone, but especially new puppy parents! Junior is so handsome and his peek a boo video is too cute. Thank you for sharing an inside look at how easy it is to use the Raising Your Puppy Training Course even with a busy schedule! Thank you, Felissa! It was my pleasure entirely! Now puppy parents can rest and learn with this training video course! Exactly, Kelly! This really is a fantastic course for busy puppy parents! Thank you for sharing these positive training methods. Many of the puppy owners I’ve met have been prepared for and know about housetraining, but my oh my, didnt prepare for the teething, socialization, etcetera. Great post to share with anyone on their way to puppyhood! Thank you, Leanne! You are right, there is so much you need to do during this small window of opportunity. Robin breaks all of it down in a very systematic way so that puppy parents aren’t left feeling overwhelmed, but rather empowered to make the most of each training session. This sounds like a great course! It would also allow you to start training earlier than if you wait for your dog to have all of their shots and be ready to go to an in-person class outside the home. We start training day 1, but because we’ve had so many dogs over the years, we know how. For new dog owners, this sounds like a great idea! That is such a fantastic point, Debbie!! I start training Day 1 as well and are very comfortable with how to do that safely, however, there are many first time puppy parents who wait until the puppy is 16 weeks before taking them out and starting training. Not only does this miss the critical window of opportunity for learning and socialization, those of us with big dogs, may have more difficulty with things like loose leash walking and managing distractions with an older puppy. Definitely better to start early and train often! Puppy training is absolutely essential. Having an online course available for people that cannot fit a class into their schedule benefits all of us that come into contact with their well-mannered dog and provides a better chance of that dog remaining in that home the rest of their lives. Thanks for sharing! Two things. First, beautiful sponsored post. Second, I cannot get over the chubby puppy photos. LOL! This is a great idea and something I would definitely consider when I lose my mind and get another puppy. Haha! Lose your mind…You can never have too many chubby puppies! Thank you, Heather! What a fantastic post and such a good idea. I love Robin’s insights and experience and OMD I am in love with the puppy. I am a firm believer that training together at home creates a lifetime bond. I completely agree with you, Carol! Thank you so much! This course looks really good. I have been meaning to cover it on my own blog. We have always done in person classes, but training at home is so much more convenient. You should definitely check it out. I have always done in person classes as well, but the busier I get, the more I see value in taking advantage of some of these remote opportunities as well. In home videos are a great idea for puppy training, especially if you don’t have the time it takes to dash off to in person training classes every week for 8 – 16 weeks of your life! I was always missing classes here & there. Explicit training videos would have been very helpful. Great review, thanks for sharing about this alternative to in person training! Pinned & Tweeted! Thank you so much, Cathy! These videos are so easy to follow and so comprehensive that I think could even serve to supplement a training program even if puppy parents do decide to do an in person class. I like the idea of a video to help with in-home training of puppies. So many people work full time and don’t have the time to take the puppy somewhere else for training. This is a FABULOUS resource. I will definitely pin this post! I especially like that it highlights POSITIVE training methods. I love that you suggest people do their research when looking for a breeder. As a rescue mom, I must also point out that there are puppies in shelters waiting for loving, forever homes. Thank you so much, Sadie. In my opinion, positive is the ONLY way to train and I was so happy to see Robin’s emphasis on using a clicker to mark behaviors and lots of praise and rewards to reinforce Ranger. Little Ranger was such a happy, eager student and I believe that is a testament to the positive methods Robin was using. And, yes, there are lots of puppies in rescue that need forever homes. However, I fully support people that choose to buy a purebred puppy from a reputable breeder. Aww love the video demonstration. Wow 11 months! He’s a big boy but then again you are dealing with big dog dog mom. He did so good! In today’s busy faced paced world I could definitely see this being a great resource for new puppy parents. Thank you, Kamira! So happy you liked our video. That was fun to do. Junior had only done a few iterations of the trick before we filmed so I was pretty happy with how quickly he figured it out. Puppy training is hard work but well worth the effort! I love Robin Bennett’s videos. She makes training look so easy and I found if I relax a bit the puppy does too and it makes it so much easier.